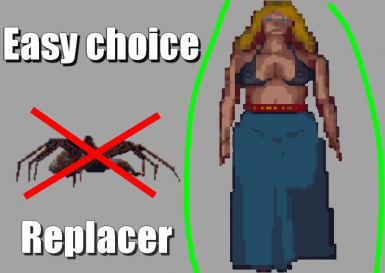 This mod replaces the Spiders by summer 'Babes'. It is an exclusive creature Bethesda didn't put in the final version of the game. The sound as been replaced by probably the most accurate one: FemaleDying/Moaning sound effect. No more Arachnophia [hehe]. 1.Just put the files in your Arena root directory. You don't need to credit me. You can also upload the mod on other websites if you want to. PS: You may notice that the spider sound file is named 'SKELETON'. Don't worry; the game knows what to do about it.